George Fisher (whose real name was Djordje Shagic) was born in Hungary to Serbian parents in 1795. He studied to be a priest and found he was adept at languages. By the time he was 17 he had mastered over a dozen languages, including Latin, Greek, English, German, French, Portuguese, Italian, Spanish, Magyar, Serbian, Russian, Polish, Bohemian, Moravian, Slovenian, Croatian, Dalmatian and Montenegrin. However, adventure called and he left school to join and fight with the Serbian revolutionary forces against the Ottoman Turks during the first Serbian Revolution. After the revolution failed, he fled Austria and worked his way across Europe to Amsterdam where and sailed as a stow-a-way to Philadelphia. In 1814, he assumed the name of George Fisher for the first time. In 1817 he moved to Port Gibson, Mississippi and married Elizabeth Davis there in 1818, becoming an American citizen. That same year he was initiated into the Masons and in 1823 became a Royal Arch Mason. Nine years after moving to Mississippi, Fisher moved to Mexico City while his wife stayed in Mississippi and raised their five children. While working as an editor for the Correo de Atlántico newspaper in Mexico City, Fisher met and was befriended by Joel Roberts Poinsett, the US Minister to Mexico after whom the Poinsettia Christmas flower is named, and together they founded the first York Rite Masonic Lodge of that city. Fisher became a Mexican citizen in 1829, and in 1830 was given a land grant (formerly called the Haden grant) by the Mexican government where he was to settle 500 families in the Mexican territory of Texas. Once the families had settled in, Fisher moved to Galveston, Texas and became the island’s customs officer. Removed by General Manuel de Mier y Terán after only a few months, Fisher moved to San Felipe in 1830 and was hired by Stephen F. Austin to be the secretary of the Ayuntamiento there. Shortly thereafter, Fisher was fired as a suspected Mexican spy, but was immediately reinstated in his old job as customs officer for Galveston in 1831. His enforcement of the requirement that all ships coming to Texas pay customs duty at Anahuac regardless of their port of entry caused a fierce reaction against the Mexican government and the ensuing “Anahuac Disturbance” (led by James Walker Fannin, who later became the commander of the Texian forces at the Alamo) was one of the first preludes to the war for Texas independence. In 1832, he was fired from his Galveston post and he moved to Matamoros, where he first worked as a customs collector, then as the Commissary General of War, for the Eastern Internal States of Mexico, (composed of Tamaulipas, Nuevo Leon, Coahuila, and Texas). After a dispute with District Judge Luis Gonsaga Martinez, he was again removed from service. In 1834, he became an auctioneer, worked as an official interpreter, founded a stationary store, began a job-printing business, and founded the Mercurio Del Puerto de Matamoros newspaper. In 1835, the year before Texas was to win its independence from Mexico, his newspaper’s editorials were deemed offensive to General Lopez de Santa Ana and Fisher was given six days by Mexican authorities to leave Matamoros, losing all his printing equipment and personal belongings to the judge who signed the warrant. Fisher then moved to New Orleans and joined together with the Mexican Brigadier General José Antonio Mexía to help organize a revolt against General Santa Anna’s centralist government. During his participation in the “Tampico Expedition” (as a Lt. Colonel serving as both Expedition Secretary and Commissary General), he befriended two other expedition members; Colonel Martin Peraza, the exiled former Commandante del Batallon del Pueblo Viejo, as well as Mr. George Robertson, the American Consul of Tampico, two men who would later play a part in his first attempt to buy Cozumel. 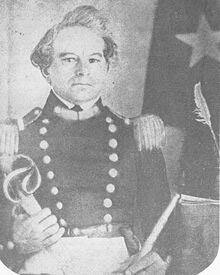 When the Texian forces defeated Santa Ana’s troops at San Jacinto in 1836 and Texas declared its independence from Mexico, Fisher took out Texian citizenship, first becoming a commission agent in Houston and then a Justice of the Peace. He moved back to Galveston in 1838 and assisted, in conjunction with Generals Sam Houston and Thomas J. Rusk, in forming several Masonic Lodges and Grand Lodges. The Brutus returned to Galveston on August 26, 1837 and George Fisher was told about the island of Cozumel by his Masonic brother, Captain Boylan. In 1838, a cotton plantation was established on the island of Cozumel by the Governor of Yucatan, the first Alcalde of Merida, and Colonel Martin Peraza. They took around 30 debtors and criminals from the prison in Merida and sent them to the island to use as forced labor. Vicente Alvino Cammañ, the Spanish-born contrabandista who ran a smuggling route from Belize to Sisal, had been living on the island since 1830 on the rancho originally settled by another contrabandista, Miguel Molas, where he farmed a little cotton with Mayan laborer. The Governor, Alcalde, and Colonel placed Albino in charge of the plantation and gave him a share of the profits. In 1840, Albino’s conscripted workers revolted, and he had to flee the island with only his clothes on his back. Meanwhile, back in Texas, Fisher obtained a divorce (granted by special act of the Texian congress) in 1839 from his wife Elizabeth, who had refused to leave Mississippi to be with him during all his travels. He promptly remarried after the divorce. Later, Fisher was admitted to the Bar and elected to the City Council of Houston in 1840. In October the same year he was served with three lawsuits for bad debts. 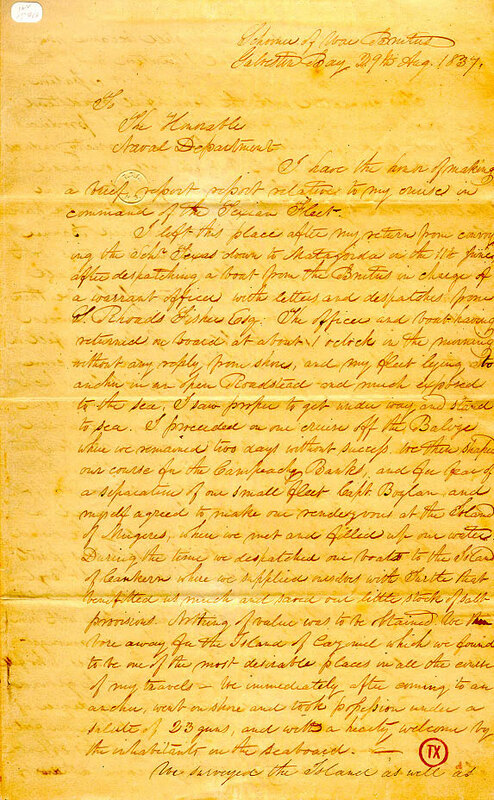 During this rough spot in his life, he wrote to his friend, Texas Governor Henry Smith, asking for an appointment to some sort of position, saying “I need excitement under my present oppressed state of mind, which can only be had by traveling, and I wish to do so, with honor to myself and profit for my country. The compensation is no object to me. I must have a diversion.” The energetic man of the world was casting about for new opportunities and, using his many contacts within the Texian and Yucatecan governments, Fisher put together a plan to buy the island his friend Captain Boylan was so enamored by and establish a plantation and logging operation there. The British Consul in Galveston, William Kennedy, maintained a network of spies and he would periodically send reports back to the Earl of Aberdeen in London, regarding the movements of the Texian navy and plans of the Texian government. In one such dispatch, dated Aug 6, 1843, Kennedy outlined the evolution of a plan by George Fisher, Mr. George R. Robinson (the former US Consul at Tampico), Texian Navy Commodore Moore, and several others to buy Cozumel for the sum of $100,000. The original plan fell through, but in 1841, Fisher made a second attempt, this time with the help of Col. Peraza who was returning to Austin via New Orleans as a special envoy from Yucatan to meet with the Texian Government. In his dispatch, Kennedy wrote that he had in his possession a letter from Col. Peraza sent to an unnamed recipient, stating the colonel would do “all that he could” to help Fisher. Kennedy states in the dispatch that on October 14, 1841, a company was formed in Galveston by three partners (and five others who had an option to purchase shares in the partnership later) to take advantage of new legislation enacted by the new governor of Yucatan, Miguel Barbachano. This new law, passed on April 5, 1841, allowed unoccupied land in Yucatan to be sold by the government. Now, Fisher’s company was angling to buy the island under the new law’s provisions. San Miguel de Cozumel in 1841, from Incidents of Travel in the Yucatan, Vol II, by John L. Stevens. In 1841 John Lloyd Stevens and Frederic Catherwood visited Merida during their trip to Yucatan and ran into Fisher there. The Serb/American/Mexican/Texian showed the two around town and helped them make contacts for their trip to the Quintana Roo coast, even introducing them to Vicente Alvino Cammañ, the last man to occupy Miguel Molas’ old rancho at San Miguel, Cozumel. Later that year, when the Stevens and Catherwood visited Cozumel (and sketched this drawing of the buildings of the San Miguel ranch for the book Incidents of Travel in the Yucatan, volume II), Vicente had just re-visited the old rancho to retrieve some of his goods that he had left there when he fled from his irate workers. In the book, Stevens tells of Fisher’s recent purchase of 18 miles of coastline in Cozumel and how he had sent up crosses along the beach to mark the boundaries of his land. Unfortunately, the remainder of the funds Fisher needed to complete the transaction never arrived in Merida (due to a bank failure in New Orleans) and Fisher had to return to Galveston in July, 1842 with only the confirmed contract to purchase, and not a signed deed. For whatever reason, the partnership fell apart, and the effort to buy Cozumel was abandoned. In 1843 Fisher became a Major in the Texas Army. From 1846 to 1848 he was translator and keeper of the Spanish records of the General Land Office of Texas, having been previously paid to interpret the Convention that framed the State Constitution and to act as interpreter and translator to the Senate of the Republic. 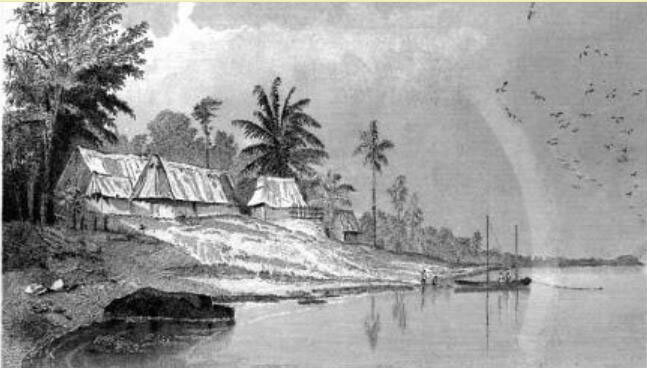 Fisher later moved to Panama in 1850, where he worked as an interpreter for a while. In 1851 he sailed to California, where he served on various city boards and councils. He was elected in 1860 to the office of Justice of the Peace of San Francisco, and became one of the Judges of the County Court, an office he held for several years. Soon after retiring from that office he was appointed by the King of Greece as Consul for that nation, an office he held to the time of his death in 1873.